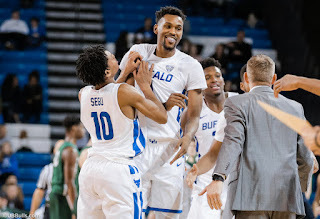 • Following a record-breaking performance on Wednesday night in their 110-71 win over Dartmouth, the #22/#25 Buffalo Bulls will host Marist on Saturday in their final game before heading overseas for the Belfast Hall of Fame Classic. UB is looking to improve to 5-0 on the season for just the fifth time in school history (1929-30, 1930-31, 1952-53, 1986-87). • Buffalo defeated Dartmouth 110-71 on Wednesday night, tying a school record for points scored in a game against a Division I opponent (Eastern Illinois, 2/27/95 & Chicago State, 2/24/98). The 39-point victory was UB's largest against a Division I opponent since defeating Navy 88-46 to open the 2010-11 season. It was the most points allowed in a game by Dartmouth since the 1974-75 season. • Buffalo's three newcomers Jeenathan Williams, Ronaldo Segu, and Tra'Von Fagan combined for 28 points, 14 rebounds, and five assists in the win over Dartmouth. The point totals for all three are career highs. • Marist is 1-3 on the season following their most recent game at Stephen F. Austin, a 64-60 loss where Marist led for the majority of the contest. Like the Bulls, Marist will head to Northern Ireland following Saturday's game for the Belfast Hall of Fame Classic. Marist's lone win came in their only home game of the season, an 82-76 win against Columbia. • Marist has three players averaging in double figures so far this season, led by preseason second-team preseason All-MAAC selection Brian Parker, who is averaging 17.8 points per game, while he is also the leading rebounder for the Red Foxes at 5.8 per contest. Ryan Funk has come off the bench in each of the first four games and is second on the team with 12.0 points per game, while David Knudsen is averaging 10.3 points per contest. • Marist was picked to finish sixth in the 11-team Metro Atlantic Athletic Conference in the preseason, receiving 59 votes. Rider was picked to win the league as they received all 11 first place votes, while fellow Big 4 squad Canisius was picked second in the MAAC in the preseason. • John Dunne was hired as the 12th head coach in Marist men's basketball program history on April 3, 2018. Dunne arrives at Marist after a successful 12-year tenure as head coach at Saint Peter's University. Won the CIT championship in 2016-17 , the program's first national postseason championship. Won 23 games, second-highest total in school history. Set program record with 14 MAAC wins (went 14-6 in conference, finished second). Has assistant coach experience at Seton Hall, Siena, Manhattan, Adelphi, Wilkes University, and Western Michigan. Dunne earned Master's degree in Sport Management from East Stroudsburg University (1996) and he earned Bachelor's degree in Psychology from Ithaca College (1992). Was a four-year men's basketball letterwinner. The 22nd ranked Buffalo Bulls will remain home at Alumni Arena on Saturday afternoon when they host Marist in the final campus game of the Belfast Hall of Fame Classic before both teams head to Belfast beginning on Monday. Buffalo has won 14 straight games at Alumni Arena dating back to last season. A win on Saturday will make it over a calendar year since the Bulls have lost a home game. The Bulls are meeting Marist for the first time since the 1994-95 season, but UB is no stranger to teams from the Metro Atlantic Athletic Conference, as they have played numerous non-conference battles with Canisius and Niagara out of the MAAC. Buffalo has played more games against MAAC opponents than any other league in the country, other than the MAC. Saturday will be the 174th game for UB against the MAAC. Buffalo continued right where it left off in the season opener, scoring 82 points in the win over St. Francis and 99 points against West Virginia. UB exploded for 110 points in the victory over Dartmouth the 57th time in 107 games as UB head coach that a Nate Oats teams has scored 80 or more points. The Bulls are 49-8 in those games when scoring at least 80 points. With his 18 points against Dartmouth on Wednesday, senior Nick Perkins is ow 12th on UB's all-time scoring list with 1,296 points, just 18 points shy of Calvin Cage (2002-06) for 11th place. Perkins was named first-team All-MAC last season and he was named the MAC's Sixth Man of the Year for the second straight season. Perkins scored in double figures in 25 straight games last year after returning to the bench. Over the previous two years, Perkins has scored 20 points or more nine times as a reserve, the sixth highest totally nationally. Caruthers has been one of the best free throw shooters in the country early on this season as he has gone 13-of-14, the second best total of the year. He picked up his first start against Dartmouth on Wednesday. Graves is averaging 11.8 points per game through the first four contests, which is third on the team. He scored 14 points in the win over West Virginia, including a few monster dunks right over the Big 12 caliber foes while tying his career high against Dartmouth with 16 points, making his first appearance on Sportscenter's Top plays this season. Senior Montell McRae is averaging 6.5 points per game through the first four contest for UB, including going 5-of-9 from three-point range early this year. McRae had 11 points in the win over Southern Illinois, while adding eight more in the victory over Dartmouth.